These are my memories of the Great Hanshin-Awaji Earthquake in 1995. This is my therapy after all, so I’ll probably keep changing and re-writing my posts over and over until I feel satisfied. Never ever expect any objective or intellectual descriptions, because my priority here is on exploring and processing my feelings. Also, I certainly do NOT intend to give anyone any constructive criticisms at all. It’s just that some things need to be taken out of my system. That's it. Nothing more. 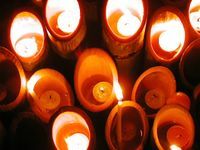 The candles in the photo are from the memorial ceremony in Kobe this year. As the cold rain put out some of the candles in bamboo tubes, always someone came by and lit them again. Again and again and again … so that our prayers won't die. Obachan, I just found this page of yours and was shocked that you were in/near Kobe during the 1995 earthquake. Kobe is Seattle's sister city and I remember the devastating news. Seattle, also part of the Pacific "Ring of Fire" fault zone, has experienced a few earthquakes. I vividly remember Apr.29,1965 a 6.4 (but @12, too young to be scared) and Feb.28,2001a 6.8 (@ work and too busy taking care of customers to be scared). The nature of our earthquakes were very different with only localized liquifaction not nearly as wide spread or severe as in Kobe or Niigata. Being very deep the movement was dampened. I don't believe the Seattle metro area suffered any casualties in either earthquake. There were injuries, building and roadway damage, but nothing on the scale of Japan or even California. Your experience was horrifying and extremely traumatic. I am glad to know you are actively doing things to help yourself heal. You will be in my thoughts and prayers every January 17. Peace of the Lord be with you. The contents of this blog created by me (text/comments and photos) are licensed under a Creative Commons License. Copyrights of free web graphics used in this site and comments made by others belong to their creators.